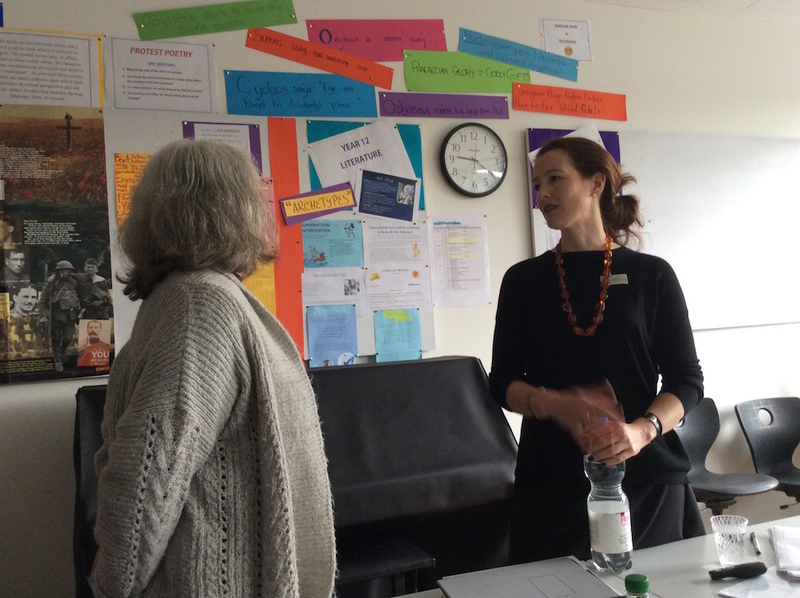 Yesterday I attended Polly Nolan’s workshop organised by SCBWI Switzerland at the International School in Lausanne. Polly Nolan (photo above with Joy Manne) is a literary agent at the Greenhouse Literary Agency. The detailed portrait that Polly gave of the publishing process and how that could affect the would-be writer was stimulating. Her answers to our many questions were clear and coherent but also often heartfelt. At the same time, the goals and limitations of the mainstream publishing process portrayed were challenging for me as an author. As I struggle to make sense of what I heard (and felt), one thing is clear – and excuse me for stating the self-evident – despite Polly’s refusal of the word ‘product’ for a book, the publishing industry is about selling and preferably selling big. The more time goes on, the bigger the targets the industry sets, the higher the returns they expect. Although clearly many of the books chosen for publishing will only reach middling results, the bar below which a book is deemed a failure continues to rise. Those of us who write novels in the hope of getting published via traditional channels might do well to factor that quest for blockbuster success into our plans and dreams. It colours not only the types of books publishers are prepared to take a risk on, but also the way they are written. It was personally reassuring to hear Polly insist that a good story will always win out. My whole quest in writing is about telling a story as best I can. But in terms of form and length as well as in terms of content, not to mention personal taste, the criteria for what constitutes a successful book limit the story that can be told and the form it can take. Despite the growing interest in alternative channels of publishing, traditional book publishing is still viewed as the pinnacle would-be authors should aspire to. All print media and most on-line review sites refuse to review indie or self-published authors. While this may be essentially aimed at stemming the overwhelming tide of submissions, it also tacitly reinforces the vision that only those who traditionally publish their book are worthy of interest. But then media and most review sites are also driven by readership and ratings and big numbers. If the threshold of success continues to rise for the publishing industry, the author has to ask herself what level of ‘success’ suits her. The video artist Bill Viola talking about installations said that they were never complete without a spectator standing in the middle of them. As authors, we clearly want to be read. I certainly do. I write stories for people to read. Apart from those who aspire to or dream of making a full-time living out of writing novels, us other authors need to ask ourselves what is our measure of success and how (and if) we can reach that, including whether the effort required is such that it causes us to cease writing. In writing all this, I in no way seek to demonise traditional publishing, but rather, thanks to Polly’s presentation, try to see it for what it is and what it can do (or not) for me as an author. As I raise the question of what size readership will satisfy an author’s need to be read, a more fundamental question arises: in a society that increasingly measures all value in terms of monetary considerations, what financial return should an author legitimately expect from her work? Very passionate and well written Alan! I will need to look up Bill Viola and find some of his post. As for readers, you have my support. Moreover, to all the readers that see this comment, please leave reviews, share post on social media, and remember that our reading voice is important! Publishing houses are not in search of a great story, but a great sale opportunity. There are many great stories that aren’t considered to be a great sellable product. It seems a contradiction in terms, but it is not. It sells more — thus from a publishing point of view it is a GREAT BOOK — 50 shades in all its tones, and sequels, and copycats. Remember what happened when JK Rowling published under a pseudonym. Sold less than 1500 copies in a year and with a great marketing support from her publishing house, even, that most authors—especially indie—could only dream of. The book became a success only after it was revealed that JK Rowling was the author. It sold 800,000 copies in matter of weeks.